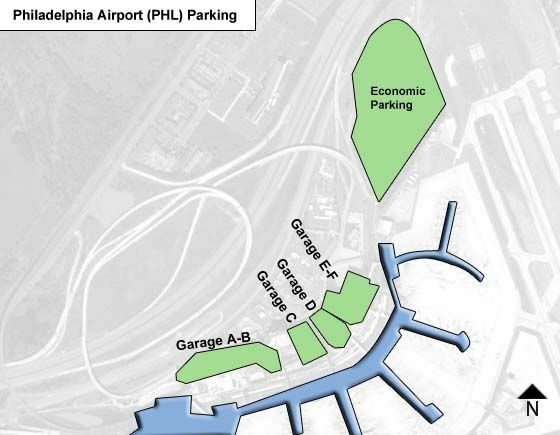 Philadelphia International Airport has more than 17,000 parking spaces located in Parking Garages, Short-Term ground level lots, and Economy lots. Vehicles such as wheelchair-equipped vans that are unable to enter the garages due to height restrictions can park in the Economy Parking Lot. Proper identification is needed such as disabled license plate and/or placard. Parking is provided by the Philadelphia Parking Authority. Tel. (215) 683-9840. Vehicles are permitted to pull up curbside, but only for actives loading and unloading. Vehicles left unattended at the curb will be towed. Motorists who are coming to Philadelphia International Airport to pick up passengers can now wait in the PennDOT "Park & Ride" lot located on Bartram Avenue adjacent to the Southbound I-95 exit ramp for Cargo City. The lot contains approximately 60 striped spaces, is lighted and has two easily accessible entrances. Drivers must remain in their vehicles while waiting for passengers to arrive at the Airport. The lot is not staffed, but is patrolled by Airport police. Economy Parking in remote exterior lot located past Terminal F. Blue & White shuttle buses run to/fr terminal 24/7.